Pioneer Seafoods has partnered with the Environmental Defense Fund to modify and enhance our trawling gear. This has cumulated in the development of Pioneer’s “light touch” trawl gear. By modifying the weight and size of our nets, this trawl gear barely touches the seafloor. We estimate that these modifications reduce bottom contact by 95%. The light touch trawl gear uses nets that target larger rockfish and other species, allowing the smaller juvenile fish to easily escape. Video cameras attached to our trawl gear allow the crew to target and view their catch before it is ever brought out of the water. Through our environmentally friendly trawling methods, we are helping ensure that our passion and dedication to clean trawling is passed along to future generations. CONTACT US to provide sustainably caught fish to your restaurant. Gear Workshop Highlights Innovators in West Coast Fishery. By Shems Jud. EDFish Blog. August 5, 2016. 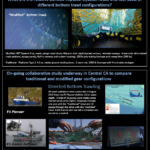 Monterey Bay Fisherman Experiments with Nets. By Erin E. Ross. The Californian. October 31, 2015. GoPro Captures Sustainable Fishing 600 Feet Under the Sea. By Sasha Khokha. KQED Science. August 28, 2015. 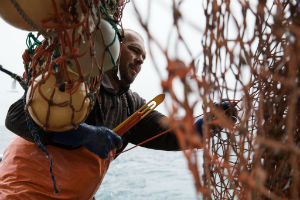 Monterey fisherman develops new eco-friendly trawl gear. By Diana LaScala-Gruenewald. Monterey County Now. August 22, 2013.